Cornelia Parker's PsychoBarn, which was first exhibited at the Metropolitan Museum of Art in 2016, currently dominates the Royal Academy Annenberg Courtyard. The large-scale outdoor installation is inspired by the Bates family motel seen in Alfred Hitchcock’s film Psycho, 1960, which itself was modelled on a painting by Edward Hopper, House by the Railroad, 1925. As with Hitchcok's stage set, Parker's installation is a scaled-down facade of a traditional American Red Barn. Behind the facade, the supporting structure is clearly visible. The installation presents a series of paradoxes, and as Parker puts it, confronts the 'polarities of good and evil'. 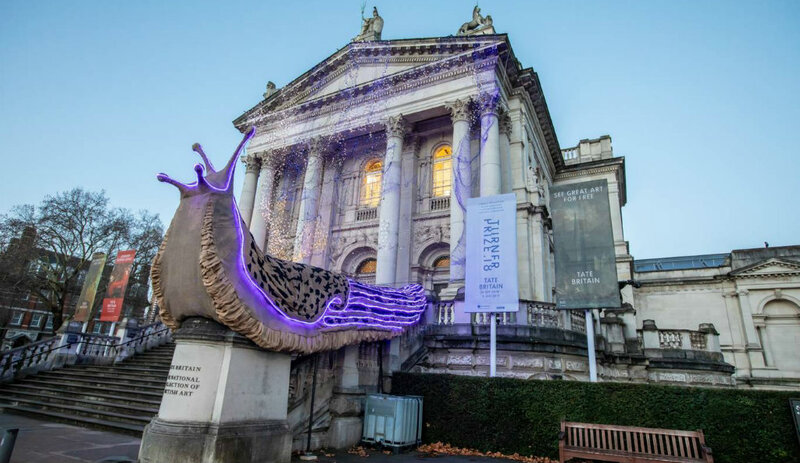 Turner Prize nominated performance artist Monster Chetwynd is the creative mind behind the two giant slugs illuminating the facade of Tate Britain. The 'slimy' glinting leopard slugs, inspired by two mating slugs in a television documentary series by David Attenborough, are this year's winter commission. The 10-metre long slugs rotate together which references the unusual night-time mating ritual of the species, as well as the metaphorical idea of rebirth during times of darkness. Chetwynd hopes her use of energy efficient blue and white LED lights and compostable materials will trigger discussions about the future of renewable energy. The slugs will be in situ until 25 February. The 11 metre high, 120 metre wide panorama, produced at Knight's SHOWstudio, will be on display until summer 2019. 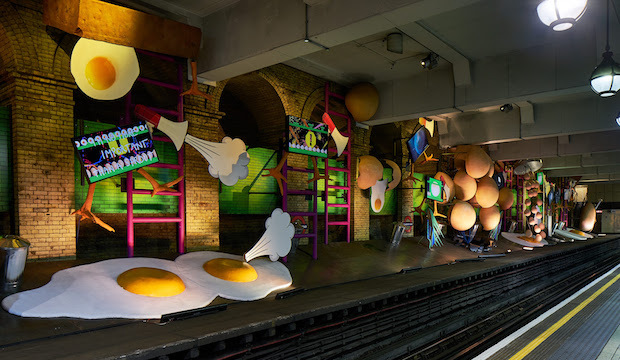 Quirky, intriguing and downright funny: my name is lettie eggsyrub – British artist Heather Phillipson's first public UK commission – spans the entirety of the 80m disused platform at Gloucester Road Underground station. On view for one year, this major new commission explores the egg as an object of reproduction, subject to human interference. In this enormous sculptural and video installation, Phillipson uses video game-style layout techniques to magnify eggs and avian body-parts to monstrous proportions. It's so unusual that it definitely merits a quick trip to Gloucester Road. Stuck in the office and desperately staring out at the sunshine? 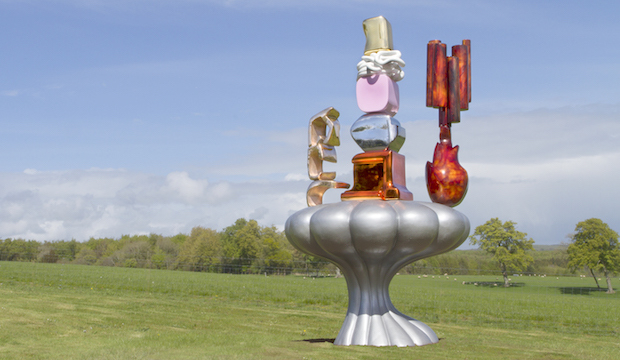 Why not take a stroll between art world heavyweights like Tracey Emin and Marina Abramovic in the eighth edition of Sculpture in the City. 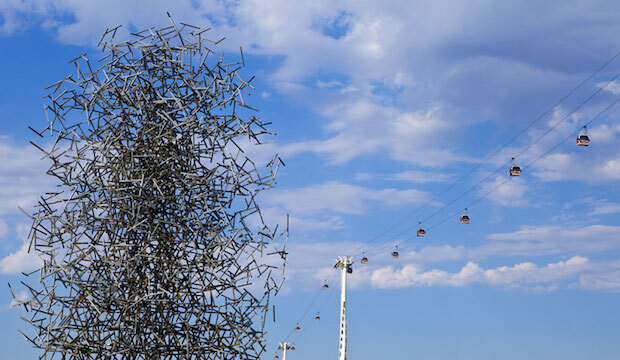 This fantastic outdoor sculpture exhibition lets visitors weave their way between the towering Gherkin, the Cheesegrater and the Lloyd's building to enjoy the best contemporary sculptures you'll find in London. East London’s reply to the New York High Line (organised by Mega Piper), The Line is London's first modern and contemporary art walk crammed full of outdoor art for the summer. Expect bold pieces and big names: a Damien Hirst artwork is accompanied by giants of the art world, from Martin Creed to Antony Gormley. It's been announced that Kristen Visbal's Fearless Girl, which stands opposite the much larger Charging Bull on New York's Wall Street, is coming to London next year. Measuring approximately 130 cm tall and weighing about 110 kg, the bronze outdoor sculpture of a girl with her hands on her hips has been a hailed as a symbol of female resilience. Propagating powerful messages about workplace gender diversity, the plaque below the statue states: 'Know the power of women in leadership. SHE makes a difference'. In this post #MeToo world, Visbal's sculpture has never felt more relevant. The subject of innumerable selfies in New York and the trigger of many gender-focused debates, we look forward to seeing its effect in London next year. Members of the City of London’s Culture, Heritage and Libraries Committee are expected to approve the plan for Fearless Girl to go on show outside the London Stock Exchange for six months from March. citizenM's chic hotel on Bankside has collaborated with London-based artist Thomas Hedger on a festive installation. The front of the building is adorned with floor-to-ceiling artworks, which change in appearance depending on the angle from which they're viewed. Step inside the hotel and head to citizenM's Secret Garden courtyard where hang bold banners featuring festive iconography distilled 'down to their raw forms and colours'. The banners make excellent backgrounds for portraits, pop on Instagram, and project Christmas cheer in every direction.